A market bubble appears to be forming in bank- and financial institution-based credit that could trigger a spike in bankruptcy filings within the next couple of years, according to Ed Altman, PhD, inventor of the famed bankruptcy prediction Z-Score model and instructor at the upcoming summer session of NACM’s Graduate School of Credit and Financial Management (GSCFM). That is likely to result in a cooling of credit released by financial institutions, putting increased burden on trade creditors. 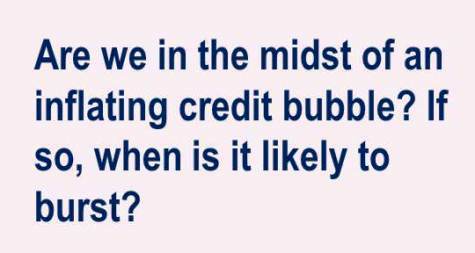 Are we in the midst of an inflating credit bubble? If so, when is it likely to burst? Contrarily, are we experiencing an extended period of opportunistic debt financing? “The evidence we have compiled leads us to conclude that, indeed, a bubble is building; but it is not likely to explode dramatically, with a significant increase in defaults, until at least late 2015 or, more likely, in 2016-2017,” the duo wrote. “Fear, however, of a potential crisis in credit and equity markets may contribute to periods of negative price movements in these and other asset classes before the bubble actually bursts.” Altman and Kuehne added that a below-average default rate should be maintained at least through fall, but the period thereafter will be problematic. The current “benign” credit cycle will approach seven years in length this year, which would rival the record in modern high-yield bond history. In short, the cycle is unsustainable and will end soon, according to their research. Altman predicts the default rate could surge to 3.3% for the year, more than a full percentage point above that of 2014. Also challenging companies’ solvency will be the inevitable increases by the Federal Reserve to the target range for the federal funds rate, which has long been held near 0% to help stimulate the post-recession economy. With the chilling effect both factors could have on lending from banks and other financial institutions, trade creditors likely will be asked to fill those gaps and extend more credit to their customers, Altman told NACM. “Yes, there will be more pressure, but firms have more reason to support marginal firms to support the business and profit margin on their products,” Altman told NACM this week.